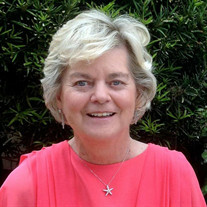 Judith Christina Rennels Tolerton died peacefully at her home in Hilton Head, SC, surrounded by her family, on February 16, 2018. Judy is survived by her husband of 53 years, James Terry Tolerton; one brother, David Rennels (Sue) of Hartville; three children, William Tolerton (Marci) of Paris, OH, John Tolerton (Kalina) of Bluffton, SC and Christina Harrell (Eric) of Greenville, SC; and seven grandchildren, Michael Tolerton, Tristan Tolerton, Kylie Tolerton, Jackson Tolerton, Ashton Tolerton, J.T. Harrell and Grace Harrell. Judy was born on October 19, 1941, in Youngstown, OH and grew up in both Youngstown and Alliance. In the spring of 1959, Judy attended Ohio University. During that time she attended a speech by then presidential candidate, John Kennedy. It changed her social, cultural and political views that evolved into a social conscience that circumscribed her entire adult life. She transferred to Mount Union in 1960 and graduated in 1962 with a degree in English. After college, she was a teacher in Lakewood, outside Cleveland and Mifland, outside Columbus. In 1972, she and Terry started Terry's Tire Town. Judy was an integral part of the success of the business. She was the original bookkeeper. She was the first Director of Human Resources, which she called the "Human Department" because she didn't believe people were merely resources. Acting as the general contractor for warehouses and retail stores, Judy facilitated numerous business expansions for Terry's. She inspired many to grow and perform beyond their own expectations. Throughout her life, Judy was dedicated to giving back to her community including work with local shelters, Meals on Wheels, United Way, the YWCA and Habitat for Humanity. In 1999, she was awarded the Athena award recognizing her impact on the community. She was a devoted member of Trinity Episcopal Church in Alliance, OH. When she wasn't busy being a businesswoman and a philanthropist, Judy loved to have fun. She was an avid golfer and tennis player. She loved deep-sea fishing and riding horses. She and Terry enjoyed travelling and learning about different cultures. Above all, she had an unwavering commitment to her family as a wife, mother, aunt, cousin, and grandmother. She lifted up and inspired those around her. A visitation will be held Friday, February 23, 2018, from 5 to 8 p.m. at Cassaday-Turkle-Christian Funeral Home. On Saturday, February 24, 2018 at 11 a.m., a funeral will be held at Trinity Episcopal Church in Alliance. In lieu of flowers, please consider a gift to: Hospice of the Lowcountry, The Greater Alliance Foundation, Alliance Area Domestic Violence Shelter, Alliance Area Habitat for Humanity or to the Alliance YWCA.